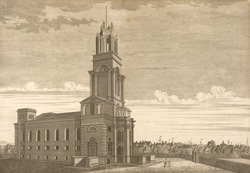 There was opposition from local clergy to the creation of the new parish at Limehouse. The new church, built in 1712-24, was not consecrated until 1730. It was designed by Hawksmoor in the shape of a Greek Cross. The church has the highest church clock in London.